BMW will be showing off the new 3 Series in October, but these spy shots give us a sneak preview of the sport sedan. After launching the and , it’s only a matter of time before the BMW 3 Series gets the redesign treatment. Our spies recently caught prototypes of the upcoming G20-generation 3 Series roaming snow-covered city streets wearing a very thin layer of camouflage, giving us our best look yet at the upcoming sport sedan. Two prototypes were spotted, including a regular 3 Series and a model fitted with the sportier M-Sport package featuring a more aggressive front fascia with large front intakes. As expected, these spy shots confirm that the new 3 Series will borrow styling cues from its larger 5 Series sibling, particularly at the front. We can now see the production lights with clearly visible LED headlights. 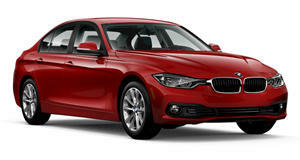 The sedan has also inherited its larger sibling’s new Kidney Grille, which looks massive on a 3 Series. While the front could be mistaken for a smaller 5 Series, the rear is less recognizable. In fact, this could be a completely new rear design for a BMW sedan. The new taillights have a more elegant shape, with a noticeably slimmer and wider design than the current model’s. Like the current car, there’s also a curved design line running across the profile, along with two other lines. One cuts across the middle of the doors, while the other runs closer to the door sills. Underpinning the next-gen 3 Series is BMW’s CLAR architecture, which should make it much lighter and improve the handling despite being larger than previous models. As for potential powertrains, BMW is keeping quiet for now, but we expect the base gasoline engine will be a 1.5-liter turbo and the base diesel to be a 1.6-liter three-cylinder. The range-topping M340i is expected to feature a turbocharged inline-six. A fully electric variant will arrive in 2020, and a plug-in hybrid is also expected. Expect to see thee 2019 BMW 3 Series break cover at the Paris Auto Show in October.